Great Mezcal isn’t illegal anymore… it’s Ilegal. It seems most of the great Whiskey distillers of today started off as illegal stills in the Highlands of Scotland or the backwoods of Kentucky. So it shouldn’t surprise us that Ilegal Mezcal started in much the same way. Back in 2004, John Rexer had a bar in Guatemala and had trouble getting a supply of Mezcal. So he would ride the local bus for a thousand kilometers each way, back and forth to Oaxaca, Mexico, stuffing bottles in his luggage. Now he imports legally — mostly — and has contract producers providing him, and us all, with a steady supply. 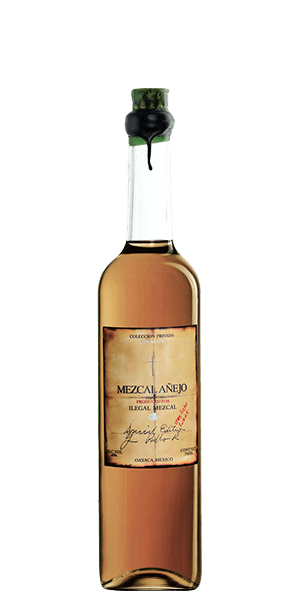 Ilegal Mezcal Añejo is made from espadín agave that has been roasted and lightly smoked. The smoke is just enough to bring a complexity and richer aroma to the spirit. It is aged for thirteen months in a combination of American oak (likely ex-Bourbon casks) and French oak cask. The combination works really well together, bringing a deeper flavor profile than you get in some lesser Mezcals. It's just out of this world. Period. What does Ilegal Mezcal Añejo taste like? The Flavor Spiral™ shows the most common flavors that you'll taste in Ilegal Mezcal Añejo and gives you a chance to have a taste of it before actually tasting it. This is garbage mezcal! Seriously, save your money and get ANYTHING ELSE. Truly overpriced garbage! Smokey and smooth. All the best parts of a great Islay with the undertones of agave. A perfect drink by itself. What good are you if I cant order products from you? What a waste of time!